Just for fun, have you seen these batters around? The inspector – takes a good hard look at everything but never touches it. The actor – looks and acts the part, goes through all the right motions at all the right times and looks like a hitter but never actually swings or makes contact. The pest – that annoying “little” hitter toward the end of a lineup who looks unassuming enough but always ends up invading your space and are tough to get rid of. The VIP – the one hitter in an opposing lineup that your pitcher gives free passes to all day long. The escape artist – always gets out. The homebody – rarely gets out. The R-rated comedian – everything they do is foul. The statue – goes into the box and stays in the box the entire at bat. Never blinks, never moves (much less swing), never steps out to get signals, and probably doesn’t even breathe in there. The hacker – the batter that goes after the ugliest pitches with the ugliest hack ever and manages to wreak havoc on your defense by placing just the right hit at just the right spot on the field at the most inopportune time for you. The Jedi – this is the hitter that NEVER seems to keep their eye on the ball when they swing, yet always manages to hit it HARD every . single . time. Obviously, the force is with them. I thought this was a really great way to describe the various hitters I deal with as an instructor and coach. I sent it to all of our 145 players and used it at a organizational seminar where each player had to describe themselves. Of course, I also had all of the Managers/coaches do the same thing for each player. Then, we coaches sat down after the seminar to compare the responses and to set in motion a plan to help these players to change either their perception of themselves or their approach to hitting. Very helpful and thanks, Stacie. Wow! How cool is that? Now, I don’t recommend “labeling” your players to the point where they pigeon-hole themselves. I don’t want your players seeing themselves in one specific way which can then translate into a negative limiting belief about their capabilities. However, I do think this list can be useful simply for identifying tendencies and addressing them. So maybe a better way to look at it would be, “Which of these describes you?” instead of “What type of hitter are you?” One makes you THAT hitter, the other simply describes how you currently tend to approach your at bats. See the difference? Thanks for the laugh Stacie, I could put a face to each one. On the other side of the ball, I had a girl that was a Michael Jackson, she wore a glove for no apparent reason..
lol Michael Jackson. I like that one! The chauffeur always drives the ball only makes hard outs usually right at people. Jiffy always hits popcorn swings under ball. Thx for the laugh!! I’ve also seen the “Hokey Pokey” batters. They take a huge step in towards the pitch every time they get ready to swing the bat. Lol. 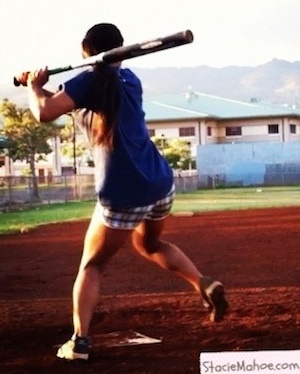 1 Pings/Trackbacks for "10 Types of Softball Hitters"